I have this spoon I bought from someone in Rhode Island and they told me they bought it in an antique store in NY city. I know there were alot of manufacturers and Robber Barons living in this area in the late 1800's. It is Gorham but I cannot find this pattern. I knew there was something special about the way it was fabricated and finished. sorry, I seem to be having trouble adding the images, I just joined. I would really like advice on this awsome spoon. I keep posting a url to my FB page where I put the photos. I keep logging back i and my images keep disapearing. I don't know if an admin is deleting it for some reason. I have re-posted the images again for like the 5th time. I logged back out and back in and they are still here. I don't know what is happening. Facebook is not suitable as a photo host. Please find another one; Peter suggests a couple in his link. I'm not sure what happened to your failed attempts but the link in your extant post does not work. I logged in and out a few times and it still worked for me, perhaps I should have deleted my cookies. I'll see what I can do, I now have a second Hindoo spoon. I would really like to know what more knowledgeable people think. I believe this to be one of the Hindoo line. It is not an exact match to any of the photos i've seen, but I don't think i've seen any two alike. here is the link to the gallery I just created on one of the two suggested. Perhaps if we could log in to FB using your ID and password we too would be able to see your pictures. Please use a different photo host; for example https://postimages.org (copy the 'Hotlink for forums' code) or http://www.tinypic.com (copy the 'IMG Code for Forums & Message Boards'). I'll try it one more time. I added the photo's on the site suggested "postimage" and yet it was deleted again. I posted the link to the album. so ill try one p.0icture at a time. Now, I'll see if I can get one image to stay up. Thank you both very much for your assistance. Just so the admins know, I have been reading the instructions on how to add images and I keep thinking I have gotten it correct. I used the URL tag above bur for some reason I must have had a space or character in the wrong order. Are these spoons all one off? I cant find a lot of information and there is one other spoon I need information on that seems to be more obscure than the HINDOO items. 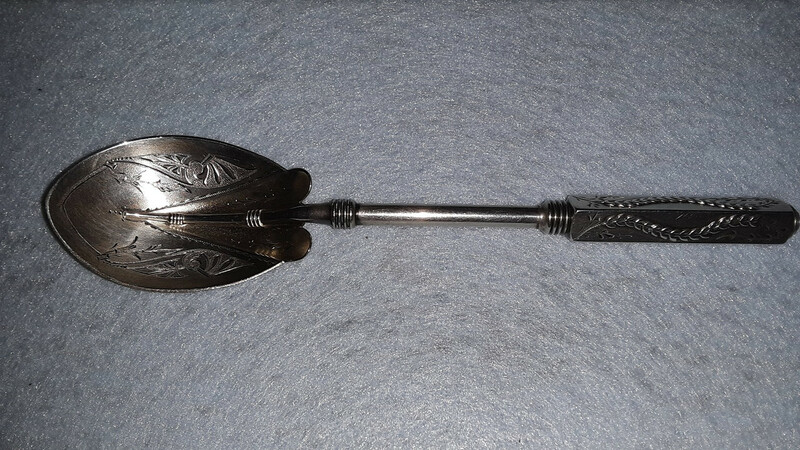 I've only seen a small spoon on this site and it has the characteristic styles of both Isis and Hindoo but this one has no name just the extra number"55" with the Gorham hallmarks and the word "sterling" and an Octagonal or Hexagonal handle. I'm hoping to have images to post soon. please be patient with me as I come up to speed. I'm a lapidary, not a computer person. I have a thread on here about "Pattern Number 55" just in case you are interested. My pieces did not match up to the "Pattern No. 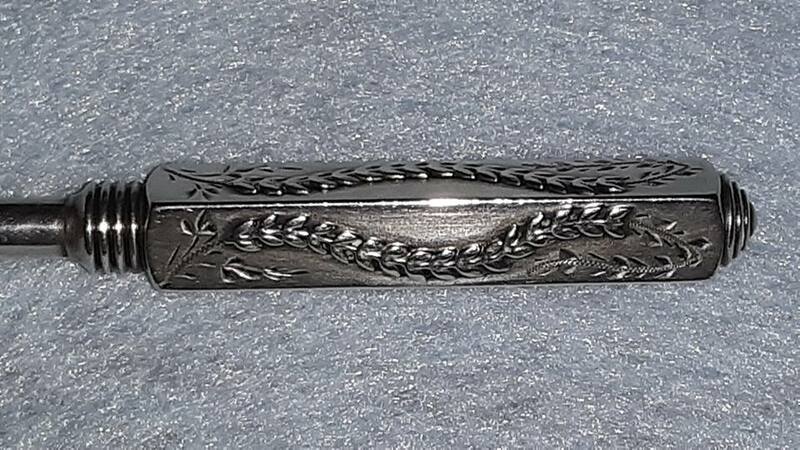 55" which is shown on the big silver pattern website, they show a black-and-white photo from an old Gorham catalogue (i presume), but it doesn't look anything like my pieces, and it doesn't look anything like your piece. Your piece does look most similar to Hindoo, that's most certainly true.